Talk presented to the Buddha Center on Sunday, May 24, 2015. The story of this sutta occurred as the Buddha was walking from the Bamboo Grove to Rajagaha, early in the morning. En route, Sigalaka, the son of a householder, was performing a ritual salutation with joined palms to the six directions – east, south, west, north, nadir, zenith – outside Rajagaha, presumably near the road on which the Buddha was travelling. The sutta says that Sigalaka’s hair was wet, presumably because of a ritual immersion in a nearby river. The Buddha, seeing this, goes to Sigalaka and asks him why he is doing this. Sigalaka tells him he is doing it to honour his father’s dying wish. The Buddha tells Sigalaka that this is not the way to do it according to the Aryan discipline. The Buddha’s approach to Sigalaka is uncharacteristically direct. Whereas the Buddha usually seeks out common ground and waits to be invited to converse, here he interrupts Sigalaka and bluntly tells him that he is wrong to be doing what he is doing. Sigalaka then asks him how he should be doing it. The Buddha’s answer shows the essence of the Buddha’s reinterpretation – or, as he would put it, restoration – of the Aryan tradition. He does not reject the ritual so much as reinterpret it. Rather, the Buddha, says, the Aryan disciple “covers” the six directions by avoiding fourteen evil ways, including four defilements of action, not doing evil from four causes, and not following six ways of wasting one’s substance. Thus, he conquers this world and the world to come. The four defilements of action (kamma-kilesa) are the familiar precepts: killing, stealing, sexual misconduct, and lying. Once again, alcohol is not mentioned. In the subsequent versification of this passage, sexual misconduct seems to be equated with adultery. The four causes of evil are desirous attachment, anger or ill will, foolishness, and fear. The six ways of wasting one’s substance are addiction to drink, frequenting the streets at inappropriate hours, going to fairs, gambling, keeping bad company, and idleness. He then expands on each of these, providing six dangers associated with each. They are all pretty obvious, so I’m not going to lay them all out here. The Buddha identifies four enemies who appear to be friends: the taker, the talker, the flatterer, and the spendthrift. Again, the Buddha gives four reasons why each of these “friends” is really a foe. The Buddha then identifies four loyal friends: the helper, the friend who is the same in happy and unhappy circumstances, the friend who points out what is good for you, and the friend who is sympathetic. Again, the Buddha gives four ways in which each of these friends is good for you, which I am not going to repeat here. Shines out like a beacon-fire. Devote it to his people’s good. (This will most advantage bring). As reserve in time of need. In this fascinating passage, the Buddha praises wealth creation, somewhat surprising given his emphasis on poverty, but of course, that is the monastic path. For the householder, the Buddha recommends saving three-quarters of one’s income, half in investments and a quarter as an emergency reserve, thus becoming quite possibly the first financial planner in history! Since there is no reference to taxation, I assume that the Buddha is basing his recommendations on net income. Perhaps surprisingly, this advice could actually work today. The Buddha intimates that the Buddhist householder should use his wealth, thus accumulated, for the benefit of others. Thus, this establishes that the wealthy have a social obligation to compensate for their privilege. Having expanded on the fourteen evil ways, the Buddha explains the six directions as an allegory in which each direction represents a specific social relationship. Also, note the sequence, which is the same as in the opening paragraph of the sutta. It implies a clockwise direction, which is associated with the attitude of invocation and positive energy. Although it appears that the Buddha is equating Sigalaka’s prayer ritual with an ethical substitute, I would like to caution the hearer about generalizing from this example that ritual = ethics. Remember that Sigalaka is a householder. Therefore, the Buddha is tailoring his comments to the station of his hearer, as was his wont. If the Buddha were speaking with a monastic, it is quite likely that the equation would be different. However, the Buddha’s allegorical manner of reinterpreting religious ritual establishes the point that ritual in and of itself has no value or efficacy and its only value lies in its interior, ethical, or even psychological meaning. This is true even in Tantra, though of course religious Buddhists tend to forget it. The Buddha then identifies five ways that one should minister to each of these groups. For example, one should support one’s parents, perform their duties for them, keep up the family tradition, be worthy of one’s heritage, and distribute gifts on their behalf after their death. Similarly, parents should restrain their offspring from evil, support them in doing good, teach them some skill, find them a suitable spouse, and finally hand over their inheritance to them. According to the Buddha, this will “cover” the eastern direction, making it “at peace” and “free from fear.” Presumably this refers to the social effects of the recommended ethical attitudes. Similarly, the Buddha discusses the ways in which pupils should minister to their teachers and teachers to their pupils, a husband to his wife and a wife to her husband, a person to his friends and companions and friends and companions to their friends and companions, an employer to his servants and workers and workers to their employer, a person to ascetics and Brahmans and ascetics and Brahmans to people. The rest of the Buddha’s advice is quite conventional. The relationship between husbands and wives involve mutual respect and fulfilling one’s duty, each to the other. There is nothing here about women being slaves to men, as we find elsewhere in the Pali Canon. Men have an obligation to honour and not disparage their wives, be unfaithful, and yield authority over the household to her, much as in ancient Greek society. Similarly, employers have an obligation to arrange the work of their employees according to their strength, provide them with food and wages, provide health care benefits when they are sick, and let them off work at the right time. This confirms statements I have made in previous talks in which I stated that the Buddha’s social views are what we today would call progressive, which is pretty remarkable considering that it has taken 2,500 years to achieve anything approaching the Buddha’s advice. The Buddha breaks the fivefold pattern somewhat with the relations with ascetics and Brahmans. He counts kindness in body, speech, and thought as three things, thus getting five in combination with keeping open house and supplying their physical needs. However, the ascetics and Brahmans will reciprocate in six ways: restraining him from evil, encouraging him to do good, being compassionate toward him, teaching him what he has not heard, and pointing out to him the way to heaven (this being the highest state that non-Buddhist ascetics and Brahmans can aspire to achieve). 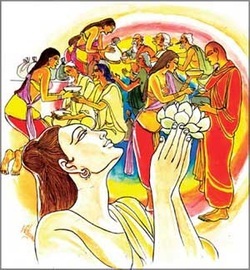 Sigalaka is so impressed by the Buddha’s speech that he becomes a lay follower of the Buddha. The Buddha refers positively toward mantra throughout the Pali Canon. There are also a number of such suttas, including the Ratana Sutta, Khanda Paritta, Dhajagga Paritta, Mora Paritta, and the Angulimala Paritta. The Metta Sutta is also used for this purpose. He also refers to the Power of Truth and the Transfer of Merit. These texts provide further evidence of my contention that the Pali Canon includes a proto-Tantric element, a.k.a. “mantra-yoga.” There are also books of parittas, including the so-called Book of Protection, to which I will give a link in the blog post corresponding to this talk. The Four Great Kings are of course the lords of the realm next above our own earth-plane. These, together with an array of yakkhas (‘nature spirits’), gandhabbas (‘aerial devas’), kumbhandas (‘dwarfs’), and nagas (‘snake devas’), who are charged with the defence or protection of the four quarters, went to see the Buddha just before dawn. These devas are described as intensely luminous beings. They all sit around the Buddha. Vessavana, the King of the North, asks the Buddha why most yakkhas are not Buddhists. The way Walshe has punctuated the text suggests that Vessavana answers his own question, whereas Rhys Davids implies that the Buddha answers this question to the effect that it is because refraining from killing, stealing, sexual misconduct, lying, and drink (note the inclusion of alcohol this time) is distasteful to them. He points out that many monastics dwell in the deep forest where there are no human beings, but many yakkhas who are not Buddhists also live there. 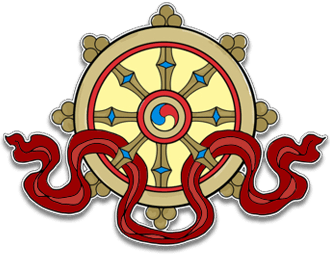 For this reason, in order protect the monastics from the yakkhas, Vessavana teaches the protective verses to the Buddha so that he can communicate them to the sangha. Thus, this is also what I have called a deva sutta, a dharma teaching received from the devas. Although yakkhas are generally benevolent, these yakkhas are ghouls that haunt the wilderness and waylay and devour travellers, like rakshasas (‘demons’). If any monk or nun, male or female lay follower learns these verses well and has them off by heart, then if any non-human being, male or female yakkha or yakkha-offspirng , or a chief attendant or servant of the yakkhas, any male or female gandhabba, … kumbhanda, … naga, … should approach that person with hostile intent while or she is walking or starting to walk, standing or rising to stand, seated or sitting down lying down or starting to lie down, that non-human being would to gain any honour or respect in village or town. Such a being would not gain a footing or a lodging in my royal city of Alakamanda, he would not be admitted to the yakkhas’ assembly, nor would he be acceptable for taking or giving in marriage. And all the non-human beings, full of rage, would overwhelm him with abuse. Then they would bend down his head like an empty bowl, and they would split his skull into seven pieces. I will append the Pali text of the protective verses on the blog post version of this talk. The verse begins with an adoration of the Seven Buddhas of Antiquity, Vipassi, Sikhi, Vessabhu, Kakusandha, Konagamana, and Gotama, except that Kassapa is left out and appears to have been replaced by Angirasa, an epithet of the Buddha meaning “the Resplendent One.” These are seven prehistoric buddhas – except for Gotama, of course – who bridge the transition from the previous eon, called the Glorious Eon, to our own time, called the Auspicious Eon. The adoration of the Buddhas is followed by an invocation of the lords of the four directions – Dhatarattha in the East, Virulhaka in the South, Virupakkha in the West, and Vessavana (a.k.a. Kuvera) in the North. These descriptions include some interesting details, including a reference to ghosts living in the south, which include abusive speakers, slanderers, murderers, greedy people, thieves, and cunning tricksters; an ideal, inaccessible land in the North, called Kuru, once again illustrating how later, in this case, Vajrayana, traditions have their basis in the Pali Canon (I am of course referring to Shambhala and similar mythologems). Northern Kuru, or Uttarakuru, is one of the four continents of Buddhist cosmology. It is traditionally described as an island in the far north, about two thousand yojanas square. The actual length of a yojana is uncertain, possibly 4.6 miles at the time of Alexander the Great, so that two thousand yojana = 9,200 miles. This gives an area of about eighty-five million square miles, compared with the area of all of the continents of the earth of about sixty million square miles. However, in the Digha Nikaya it is also given as the name if a city. Elsewhere it is described as an island. The inhabitants of Uttarakuru are described as extremely wealthy, long-lived, without private property, and living a thousand years, something that seems far less improbable now that anti-aging researchers are beginning to talk about functional human immortality. According to the Mahabharata, the Kurus practise free love. Their cities are aerial, like the floating geodesic spheres described by R. Buckminster Fuller. Clearly, then, they are also highly technically sophisticated. Like Shambhala, Uttarakuru is virtually inaccessible. The original Vedic reference to Uttarakuru places it beyond the Himalayas. The inhabitants of Kuru, a mahajanapada in the northwest region of northeast India, were said to be descended from them. The female arhant Satulakayi is reputed to have come from Uttarakuru. Finally, the verses conclude with an adoration of the Buddha. There are, sir, some non-human beings who are fierce, wild and terrible. They heed neither the Great Kings, nor their officers, nor their attendants. They are said to be in revolt against the Great Kings. Just as the bandit chiefs whom the King of Magadha has overcome do not heed him, or his officers, or their attendants, so too do they behave. Sometimes monastics would experience themselves being attacked by these beings. The Buddha also describes the intense fear that one experiences alone in the deep forest. Although northeast India seems quite arid today, the frequent references to deep forest in the Pali Canon suggest that the area must have been far more heavily forested than it is today, like many other places in our diminishing world. The Buddha himself experienced this fear when meditating alone in the forest at the beginning of his career. It is of course tempting to apply Western “psychologism” to this phenomenon and say that they are experiencing hallucinations because of sensory deprivation and intense emotional agitation. However, one could just as easily say that these psychological conditions are simply creating the conditions necessary to perceive actual spiritual beings that exist on the threshold of consciousness. Vessavana gives a list of 41 yakkhas, great yakkhas, commanders, and commanders in chief, which include the names of gods, ancient rishis, yakkhas, and nagas. In a manner reminiscent of Western occultism, Vessavana recommends invoking the names of these beings if one is attacked. I know of one case that I will try to find and attach to the blog post of this talk, in which a Thai Buddhist monk – a Westerner – had his cave invaded by a cobra I think it was, and who recited the protective verses and the cobra went away. There’s more to the story too. ‘‘Vipassissa ca[ime cakārā porāṇapotthakesu natthi]namatthu, cakkhumantassa sirīmato. Sikhissapi ca [ime cakārā porāṇapotthakesu natthi] namatthu, sabbabhūtānukampino. 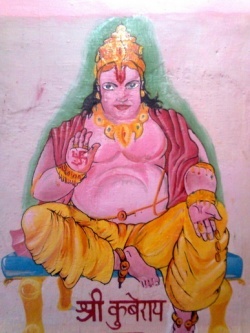 Kassapassa ca [ime cakārā porāṇapotthakesu natthi] namatthu, vippamuttassa sabbadhi. Yo imaṃ dhammaṃ desesi [dhammamadesesi (sī. syā. pī. ), dhammaṃ deseti (? )], sabbadukkhāpanūdanaṃ. Te janā apisuṇātha [apisuṇā (sī. syā. pī. )], mahantā vītasāradā. ‘‘Yatouggacchati sūriyo[suriyo (sī. syā. pī. )], ādicco maṇḍalī mahā. Yassa cuggate sūriye, ‘divaso’ti pavuccati. Evaṃ taṃ tattha jānanti, ‘samuddo saritodako’. Yaṃ disaṃ abhipāleti, mahārājā yasassi so. Asīti dasa eko ca, indanāmā mahabbalā. Sutaṃ netaṃ abhiṇhaso, tasmā evaṃ vademase. ‘‘Yena petā pavuccanti, pisuṇā piṭṭhimaṃsikā. Pāṇātipātino luddā [luddhā (pī. ka. )], corā nekatikā janā. ‘‘Yattha coggacchati sūriyo, ādicco maṇḍalī mahā. Yassa coggate sūriye, ‘saṃvarī’ti pavuccati. ‘‘Yenauttarakuruvho[uttarakurū rammā (sī. syā. pī. )], mahāneru sudassano. Manussā tattha jāyanti, amamā apariggahā. Tuṇḍikīre pacitvāna, tato bhuñjanti bhojanaṃ. Pasuṃ ekakhuraṃ katvā, anuyanti disodisaṃ. Purisaṃ vāhanaṃ katvā, anuyanti disodisaṃ. Kumāraṃ vāhanaṃ katvā, anuyanti disodisaṃ. Pāsādā sivikā ceva, mahārājassa yasassino. Nāṭasuriyā [nāṭapuriyā (sī. pī. ), nāṭapariyā (syā.)] parakusiṭanāṭā. Tasmā kuvero mahārājā, ‘vessavaṇo’ti pavuccati. Ojasi tejasi tatojasī, sūro rājā ariṭṭho nemi. Vassā yato patāyanti, sabhāpi tattha sālavatī [bhagalavatī (sī. syā. pī.)] nāma. Kukkuṭakā [kukutthakā (sī. pī.)] kuḷīrakā, vane pokkharasātakā. Sobhati sabbakālaṃ sā, kuveranaḷinī sadā. Piyadassi, trans., The Book of Protection (Paritta), 1999, http://www.accesstoinsight.org/lib/authors/piyadassi/protection.html. Sadaputa Dasa, “Exact Science in the Srimad-Bhagavatam,” http://www.krishna.com/exact-science-srimad-bhagavatam. Alexander Berzin, July 2008, revised Aug. 8, 2013, “Recitation of Mantras,” http://www.berzinarchives.com/web/en/archives/advanced/tantra/level1_getting_started/recitation_of_mantras/transcript.html. “A Tibetan Book of Spells,” Feb. 19, 2009, http://earlytibet.com/2009/02/19/a-tibetan-book-of-spells. I have created a Wikipedia book in PDF format called Buddhist Mantras, Malas, and Magic. Pleae email dollarability@gmail.com if you would like a free copy.